It’s almost hard to remember how we used to buy mattresses. Perhaps you’d go to a mattress store like Sleepy’s or a department store like Macy’s. You would test out a few brands to find the best one for your needs and place the order in the store. The store would then deliver it to your home and take away your old mattress. All that changed when Casper started selling their beds in boxes. Now, you can order a mattress with the click of a button, and soon a gigantic, 90-pound cardboard box filled with foam will arrive on your doorstep. Sure, this disrupted how we mattress shop. But it also disrupted in a more harmful way – adding unnecessary cardboard to a process that previously didn’t have any. Casper isn’t the only company injecting wasteful cardboard and harmful shipping into new industries. Direct-to-consumer brands, which almost always operate on a model that relies entirely on shipping, aren’t good for the environment. In 2016, 65 billion packages were shipped globally – a 48 percent increase from 44 billion in 2014, which was largely driven by online shopping. It’s important for direct-to-consumer brands to reduce their environmental impact from a social consciousness perspective, but also it’s just good business. Direct-to-consumer brands are often popular with millennials and Gen Z shoppers, and as these groups become more and more environmentally conscious, these brands’ survival may depend on their ability to do more to mitigate their damaging effects. Let’s use Warby Parker as an example. They revolutionized the way we buy glasses not only by making them cheaper, but also by allowing customers to try on multiple pairs at home before buying. However, that requires shipping the try-on glasses to the customer, having the customer ship all of those glasses back, and then shipping the customer the glasses they are actually purchasing. This process means there will be three truck trips when there only needs to be one. Or consider Rent the Runway, which rents designer dresses. While the re-wearing of dresses is inherently eco-friendly and the company has made progress in shipping their items in reusable garment bags, their new Unlimited program presents an issue. Customers can now rent four items at a time, meaning that they are constantly shipping items back and forth. All of those truck trips add up. Emissions from light-duty trucks – the trucks typically shipping consumer goods – comprised 18 percent of transportation emissions in 2016. What’s more alarming is that the direct-to-consumer model extends beyond specialty items and is now changing the way we purchase everyday items. Trips to the grocery store have become meal kits sent to your door once a week, filled with garlic cloves in plastic baggies and a few pounds of freezer packs that get tossed in the trash. A drugstore run to pick up the occasional toothbrush and razor has become Quip toothbrush heads and Dollar Shave Club razors regularly arriving in the mail. So what should direct-to-consumer brands do to fix it? Brick-and-mortar stores alone won’t solve this problem. If I were to walk into a Warby Parker store right now and purchase a pair of glasses, they would still get shipped to my house after being filled with the correct prescription. Casper mattresses purchased in-store will also be shipped to you. However, shifting towards brick-and-mortar is the right strategy, if it’s done well. For example, Quip is now selling their product in Target stores; customers will still get their brush head refills mailed to them, but it cuts out at least one shipment. Brick-and-mortar stores are not only better for the environment, but give customers the opportunity to connect with the brand in real life. They also let shoppers test out the products, which will contribute to less returns and less items shipped back. 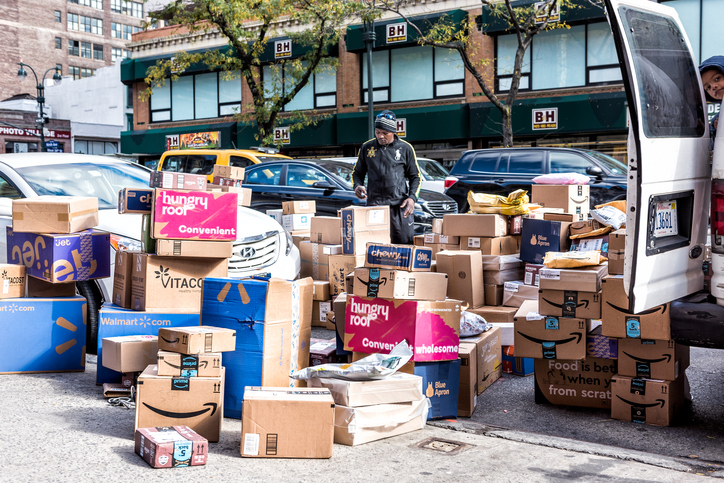 E-commerce purchases have a return rate of 30 percent, compared with brick-and-mortar’s 8-10 percent rate, and it’s better for the environment to return items to a store versus shipping them back. When retailers invest in their brick-and-mortar locations, customers will leave with a positive impression of the brand and feel confident that they’ve purchased the right product – no cardboard needed. It’s dangerous to head in a direction where everything we buy is shipped from fulfillment centers in extra cardboard boxes on trucks to our doors. Too much unnecessary waste is produced in the process. Consumers should expect direct-to-consumer brands to make efforts to limit their damage to the environment – and take note when they don’t – and brands should take this opportunity to be leaders on an issue important to their customers.